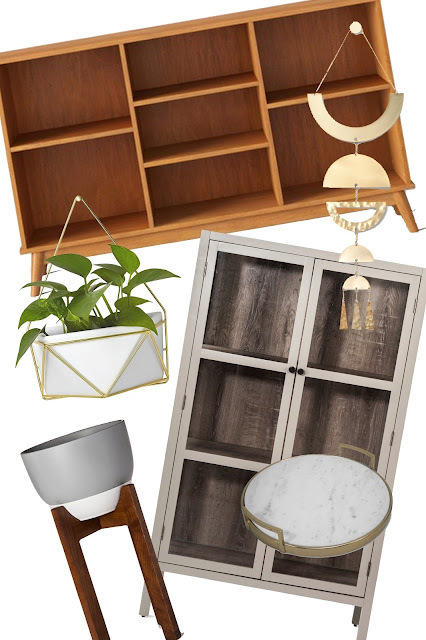 Target has been killing it with home decor launches this year and their new Project 62 line has sent my mid century modern loving heart a flutter. Although I'm trying to reign in my spending to save money for Christmas gifts, a little lusty post never hurt anyone, right? The biggest piece that sent me down the Target wishlist rabbit hole was the Amherst Mid Century Modern Horizontal Bookcase. I've been casually looking for a behind-the-couch piece for our living room to greet anyone who walks through the front door. This would be a fabulously interesting piece that I could decorate with plants, board games, and other trinkets. Plus it's low enough to sit nicely behind the couch with room for photographs (and more plants) on top. My obsession with plants has reached new heights and the three different sizes of Ceramic and Wood Planters speaks to my soul. They're such a simple design but the perfect way to get a plant off the floor while not taking up counter space. Since I am a beauty blogger of course the Gold and Marble Tray caught my attention. Nothing says blogger extraordinaire quite like marble. It would also make a fabulous cheese board or corralling piece for a coffee table. Although I've told myself time and time again that the space-themed guest bedroom is finished, I keep finding pieces like this Brass Wall Hanging that would look great in there. Everything about Project 62 is so simple, clean, yet incredibly functional. I thought I'd throw in this Threshold Library Cabinet into the mix despite it not being apart of the new collection because it's so stinkin' perfect for holding all of our travel memorabilia and collections. The glass panels on three sides make it easy to view all of our favorite things without the risk of anything getting bumped and broken. Now if only I was made of money and could scoop up all these gorgeous pieces in one mad dash, but sadly I have to be a bit more realistic. So I'll stick to gushing over them in blog posts. What home decor pieces have you been lusting over lately?